French Doors are comprised of clear glass panes for the most of their length and are an excellent addition to any home adding style and opening up your home to the outdoors. The glass may be a large piece or many smaller panes set into the frames. 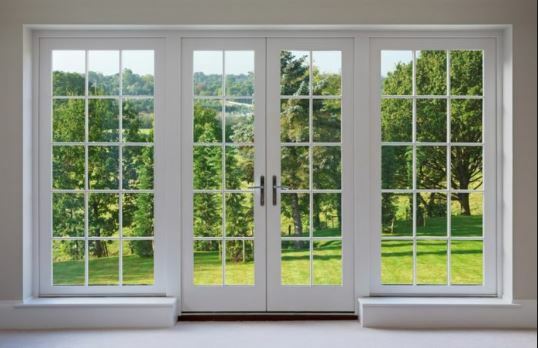 French Doors are usually installed in pairs, have hinges on the sides and open in the center. You can usually expect to see French doors connecting two rooms or as an exterior door. One of the biggest advantages for French Door installations are their lightweight and ease of installing. These are typically made of thin pieces of wood or metal and panes of glass which let more sunlight travel into your home. Since these doors are so lightweight and not as secure as other doors that are made up of solid wood or metal, they can be used as a backyard exterior entrance from your garden for example. If your set of doors are made of wood then you can add additional customizations like choosing a particular wood and stain to either match a room or add to the existing home. You can also decide to have them painted to match an interior room or area as well. French doors are both highly functional and aesthetically pleasing, functioning as both a door and as a window. These are a classic choice for any homeowners looking to bring a little more class into their home. Beckworth LLC will go above and beyond to help you with your new or replacement door selection. Our team is dedicated to helping and educating our customers so that they make the best buying decisions for their home and lifestyle. Just give us a call for a free estimate or to answer any questions you may have.